The case, meanwhile, assumed political overtones after it was alleged that the perpetrators had links with the AIADMK. Two FIRs were filed — one by one of the victims and another by her brother. Under pressure from Opposition DMK, both FIRs were transferred to the Central Bureau of Investigation by the state government. In one of the videos, a blurred image of a young woman wearing leggings is seen with her hands shielding her upper body and a bare waist. She cowers, stepping from side to side in panic, shuddering as she pleads in Tamil, “Please anna, don’t hit me, don’t hit me.” Multiple men are in the room, one holding what appears to be a belt. “I trusted you as a friend, why are you doing this,” she is heard pleading with her assailant, whom she addresses as Rishwandh. Tamil magazine Nakkheeran also released blurred videos. The ruling AIADMK has been criticised for the alleged involvement of its party leaders and for shielding the accused in the case. 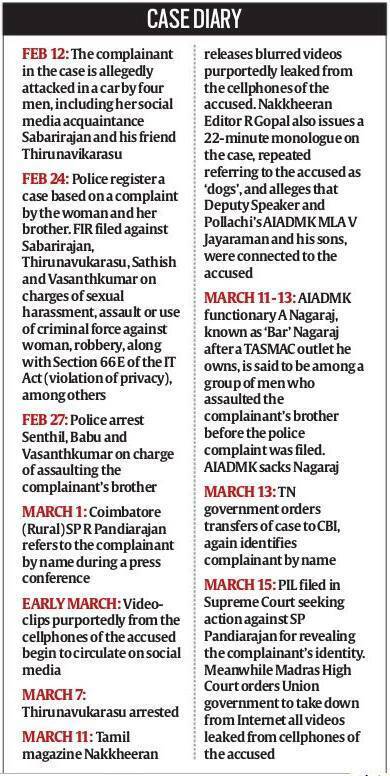 While one of the accused is an AIADMK local functionary, another leader named A Nagaraj is accused of assaulting the complainant’s brother. Tamil magazine Nakkheeran Editor R Gopal also alleged that the Deputy Speaker and Pollachi’s AIADMK MLA V Jayaraman, known as Pollachi Jayaraman, and his sons, were linked to the accused. Jayaraman has denied any role. Across the city, while there’s unanimity on the demand for an impartial and thorough probe in the case, the victims are also at the receiving end of criticism with many questioning their intentions. 3 Brexit: What will happen in the British parliament today?